Italy's GDP growth has been revised down from 1% to 0.1%. Germany's GDP growth has been revised down from 2% to 0.8%. Both economies struggle, but Italians currently laugh in the face of Germans. 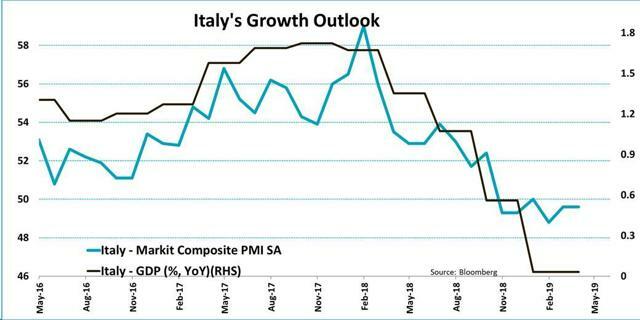 During the fourth quarter of 2018, Italy (EWI) and the ECB have clashed repeatedly over the Italian government's intention to maintain a budget deficit of ~2.4%, above the ECB's 2% officially allowed ceiling. Eventually, the two sides have come to an agreement with Italy allegedly complying with the ECB requirements. Why "allegedly"? 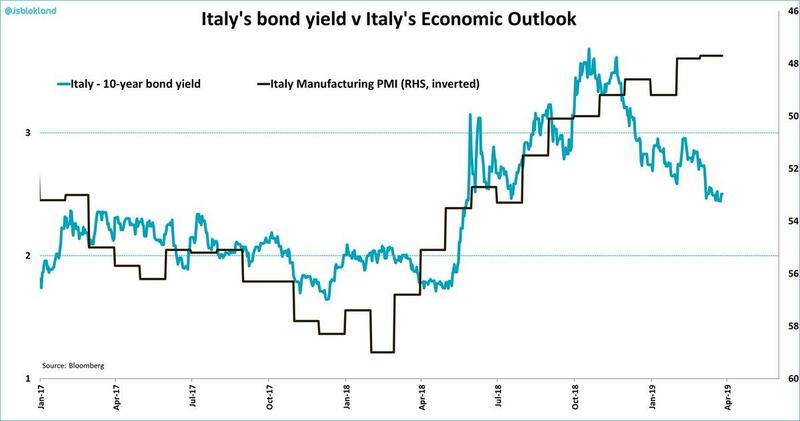 Because the underlying growth rate that "allow" for Italy to maintain a 2% deficit was too optimistic all along. 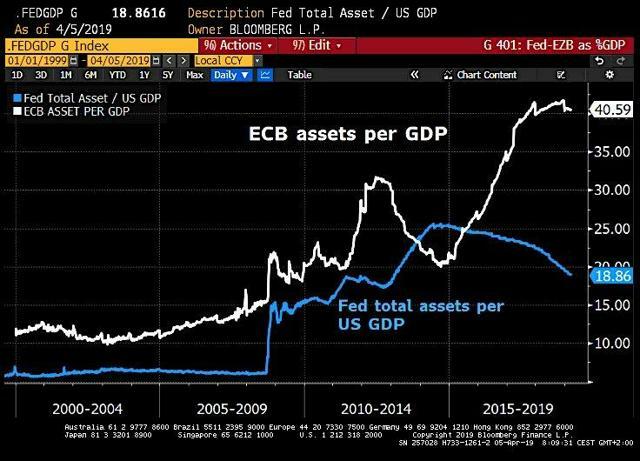 Thing is, both Italy and the ECB knew it back then, but they chose - for their own selfish/political reasons - to bluff; something the ECB is doing for a long time. For a while, it actually looked as if Italy's GDP growth has stabilised, albeit at a very modest pace. That, of course, until reality hits, and the bluff can no longer hold. Earlier this week, Italy slashed its 2019 economic forecast from 1% to a mere 0.1%, essentially putting the deficit back to where it was only few months ago, before the ECB "succeeded" in causing Italy to comply with running a lower budget deficit. Perhaps it's not a coincidence that this joke/prank was pulled off on the very same week as April Fools' Day. 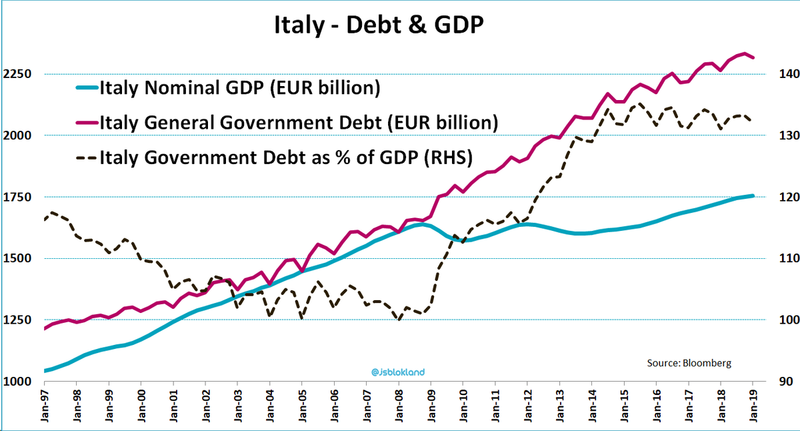 Stagnation will make it even harder for Italy to take full/genuine control over its fiscal situation. 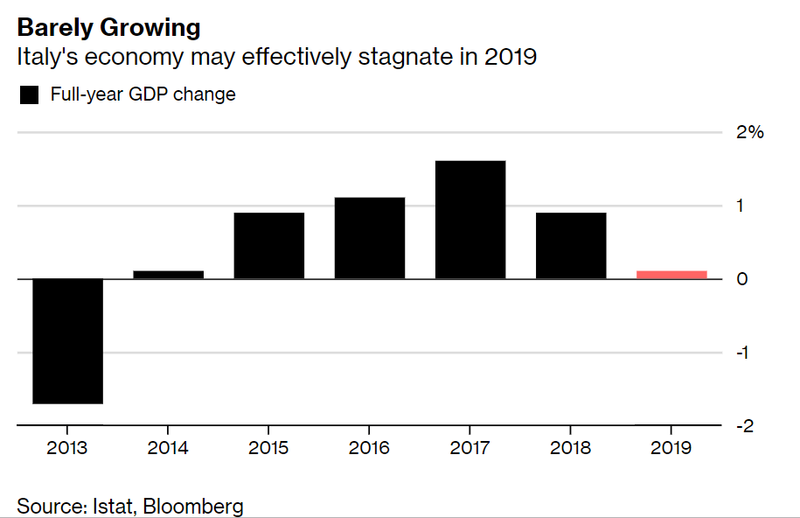 The budget deficit is now projected to be about 2.3-2.4% of GDP versus the previous forecast of 2.04% - the level that Italy agreed on with the ECB towards the end of 2018. The new projection is, of course, only worth the paper it's written on, if Italy can deliver on other metrics as well. For the record, I don't believe in the boot country's ability to keep up even with this revised projection. 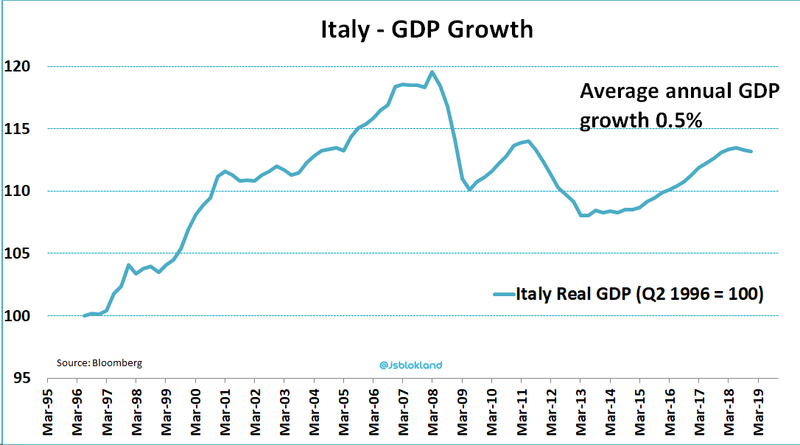 Not only the Italian economy may effectively stagnate in 2019, but also the 0.1% is not that far below the average annual GDP growth the country has posted over the past two decades. Putting it differently, if you think that 0.1% is too low, think again; it's not! Obviously, very low (nominal) GDP growth is a major problem in and of itself. Having said that, there are more implications to the practically zero growth rate. For example, this means that Italy's debt pile will almost certainly grow further (that's more than expected), as the country will have to tap the markets again with more debt issuance to close the growing gap (between the red line and the black line). 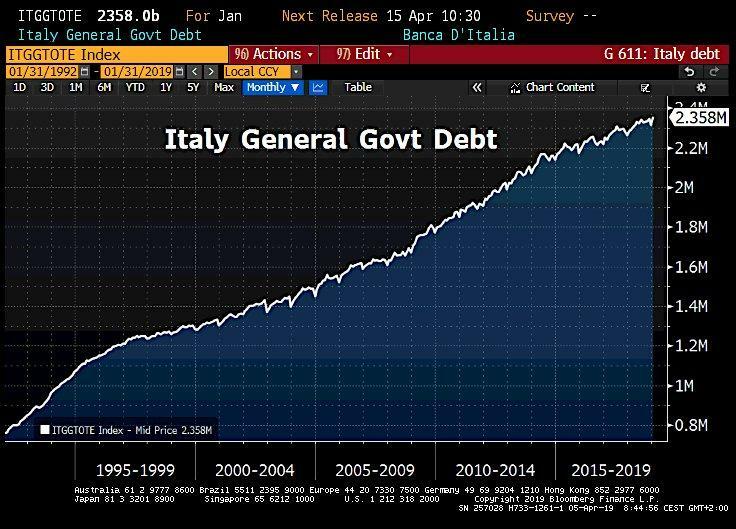 Italy's cabinet has approved a series of measures to boost the struggling economy, just as the total debt has hit a fresh all-time high at €2,358 billion. The so-called "Growth Decree" contains various incentives, including measures aiming at encouraging more private investments, as well as (better) safeguarding the "Made in Italy" brand. The real funny thing is that in spite all this Italian "doom and gloom", its 10-year bond yield has decoupled from its economic outlook. "How come? ", you may ask. Well, that's an easy one. The massive U-turn in monetary policies (aka madness) globally is allowing for the bluff to staying alive. The Bank of Japan (EWJ) (DXJ) is running its monetary madness non-stop for years. The ECB had good intention until three months ago, putting its own version for "Money For Nothing" on hold at the end of 2018. However, the economic situation in Europe (VGK, EZU, HEDJ, FEZ, IEUR, BBEU, IEV) is so bad that it took only two months for the ECB to make a sharp U-turn. Now, we also have a bearish Fed (SPY, DIA, QQQ, IWM), allowing for the bluff to keep getting kicked down the road. 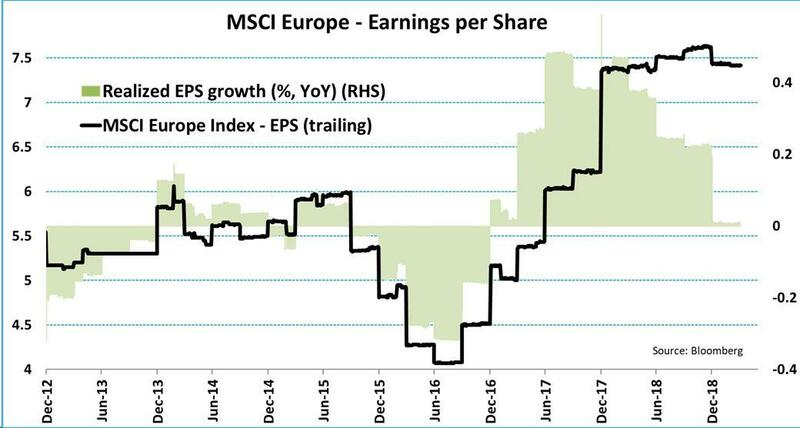 German (EWG) Economic Institute just slashed the 2019 growth forecast for Europe's largest economy by more than half. In its latest outlook, the institute predicted that Germany's GDP will expand by only 0.8% in 2019. As a reminder, back in September, it expected a growth rate of 1.9%. The open question is: Where does this stop? 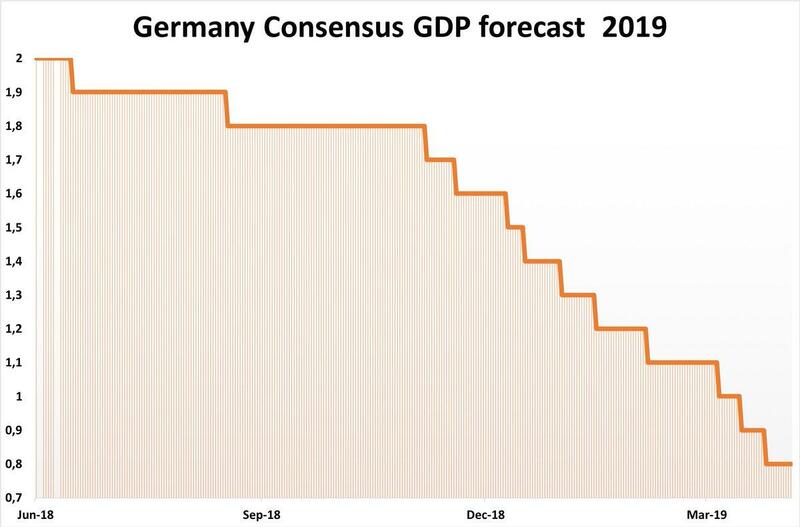 I mean the consensus for 2019 GDP growth has dropped from 2% to 0.8% in Germany and from 1% to 0.1% in Italy. Can/should we assume this is the end of it, or only just another stop on a long-standing decline? The expected earnings growth for the MSCI Europe Index (IEUR), which has now gone flat, certainly doesn't leave much room for optimism. The Germans bailed out the Italian banking system. In return, they are now poised for negative real returns for years to come, and their savings have been de-facto transferred to Italian debtors. You know what's the real funny thing? That Italians, e.g. UniCredit (OTCPK:UNCFF, OTCPK:UNCFY, OTCPK:UNCRY), are using the German money now to buy back the German banks/assets, e.g. Deutsche Bank (DB). That, of course, if the proposed merger of DB with Commerzbank (OTCPK:CRZBY) (OTCPK:CRZBF) won't happen.